Take the way back machine to the first GIS Day in Spring of 1999. 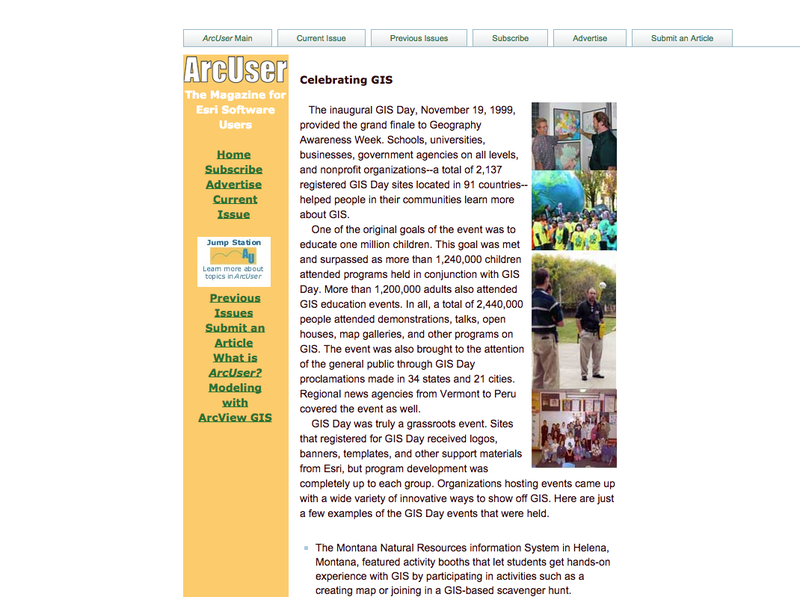 ESRI ARC News Online announced GIS Day 1999 Slated for November! According to the press release, ESRI told users to “Get ready to learn more about GIS and geography. The National Geographic Society, the Association of American Geographers (AAG), and Esri are announcing the first annual GIS Day to be held November 19, 1999–the Friday of Geography Awareness Week (November 14-20, 1999)”. According to Jack Dangermond, “The idea behind GIS Day is to create a single, worldwide event that effectively communicates the benefits and significance of GIS to the rest of society. There are about half a million GIS users in the world, but most of the public is unaware of this growing technology.” It is difficult to comprehend that in the span of a little more than short years since that inaugural GIS Day, the world has experienced what Penn State calls the geospatial revolution significantly impacting the number of GIS users worldwide. According to GIS Lounge’s GIS Timeline, since 199 we have seen the release of ArcGIS on December 27, 1999; release of Google Earth in 2005, the subsequent invention of Web 2.0, user generated content, crowd-sourcing, location-based services, mobile applications, cloud computing, Open GIS, GPS, advances in remote-sensing LIDAR, and a host of other geospatial technologies (including the start of VerySpatial almost 10 years ago). Open Street Map alone has over 400,000 registered users. Each of these geospatial innovations furthered National Geographic Association’s desire to get geography back into classrooms and to make sure that it is well-taught, well-learned, and well-applied. Can you envision what each of these students, often equipped with geospatial technologies in elementary school, will create in the next 15 years. What are some of the advances in GIS you have experienced since the first GIS Day? ** I had a long debate with several GIS professionals if it was the 15th anniversary of GIS Day, if it started in 1999. Our consenus (after much finger counting) was that it was the 15th anniversary but the 16th year – that the first year isn’t an anniversary year because it is the inaugural event.Do you think this is the 15th anniversary or 16th anniversary?